has characteristic mint and spice back-notes. Myrrh, Nutmeg, Rosewood, Rosemary and Thyme. Historically, the leaves were used as a substitute for tea,which is how tea tree oil got its name. It was first used by the aboriginals in Australia to treat cuts, burns and any type of infection. It has since become a very popular oil and is used worldwide. Chinese tea tree plant is a small shrub with needle like leaves similar to that of the Australian variety. eczema and psoriasis.It is also an ingredient in creams,ointments,lotions,soaps,and shampoos. 1.Add 5-7 drops(0.3 ml) to water in a vaporiser or burner. 2.Add 10 drops(o.5ml) to 15- 25ml of vegetable carrier oil for use in massage. Plastic Jerry Cans, 180KG Galvanized Drums or as per your requirements. 4.Delivery:By UPS/DHL/TNT/EMS or by Air/ Sea as per Qty or as your requirements. 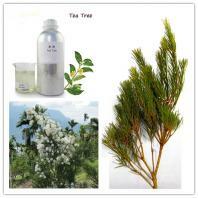 Our company is specialized exporter, manufacturer and supplier of Tea Tree Essential oil in China.